Appalachia Resist!, an organization recently formed to address exploitative gas and oil extraction in Appalachia, along with Ohio residents and other environmental organizations have blockaded and disrupted operations at Greenhunter Water’s hydraulic fracturing or “fracking” waste storage site along the Ohio River in Washington County. Nate Ebert, a 33-year-old Athens County, OH resident and member of Appalachia Resist!, ascended a 30 foot monopod (pole), anchored to a truck that was dropping off toxic frack waste at the facility, preventing all trucks carrying frack waste from entering the site! Two banners have also been hung from two different tanks holding fracking waste. The main gate to the facility has been locked shut by activist. All gates have been blocked and all action at the site has been halted. Full press release here! The mining of carcinogenic bitumen is powered by gas obtained from hydraulic fracturing which can NOT be done safely and should not be done at all. This is NOT a debate. We stand in opposition not only to TransCanada and their Keystone XL Pipeline but to all corporations and entities who function only by the direct suffering of others. Members of the blockade have traveled to Southern Ohio to participate in an action with an unprecedented show of unity joining members of the following groups: Appalachia Resist!, Radical Action for Mountain Peoples’ Survival (RAMPS), a coalition of indigenous leaders including representatives from No Line 9 and the Unis’tot’en Camp, Tar Sands Blockade, Great Plains Tar Sands Resistance, and dozens of Earth First! groups from across the country. Tar Sands Blockade stands in solidarity with Appalachia Resist, Ohio residents, and all those fighting dangerous and exploitative resource extraction world wide. Still wondering what to do with that fiery heart of yours in mid-February? Come join us in the hills and hollers of the unglaciated Allegheny Plateau February 14-18, for the 2013 Earth First! Organizers Conference and Winter Rendezvous. The Organizers Conference, Thursday thru Saturday afternoon will be focused on reports from the Journal; evaluating strategy, tools & tactics; examining our visions & aspirations; where we’ve been, where we’re going; state repression review; anti-oppression check-in; and bioregional round-ups, and the Night to Howl gathering of the Warrior Poets Society. After three days of meetings, Saturday night the Winter Rondezvous will kick off with a fiesta (we’re working on a square dance, yehaw), followed by two days full of workshops, hiking, and action planning. Don’t forget that no good Rondezvous could end without a kickass action! The Central Appalachian bioregion touts being one of the most biodiverse temperate forests in the world. Fracking and radioactive, chemical laced fracking waste being injected into the earth are an eminent threat to the this region. 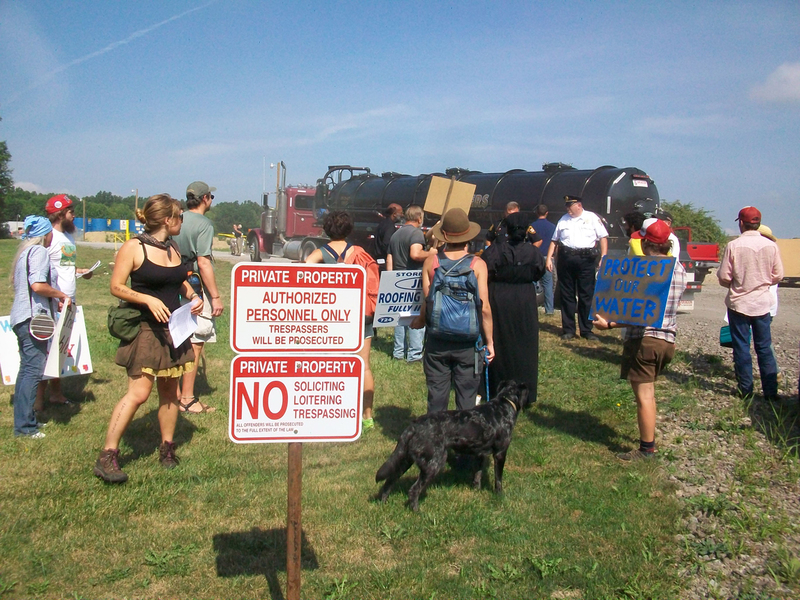 Locally, folks have blockaded an injection well and disrupted a meeting of the Ohio Division of Natural Resources. With a large amount of local opposition to injection wells, we invite y’all to help us stamp out these toxic dumping practices, which are a lynch pin to the fracking industry. The site, located about 25 minutes outside of Athens, Ohio, is a longstanding intentional community that will be sharing their space with us for the week. There is plenty of indoor space for meetings and sleeping (although some is slumber party style), as well as lots of camping options for those opposed to the great indoors. February in this area can bring temperatures anywhere from 55F during the day to 0F at night, so please come prepared for cold weather and mud/snow. This time of year is often when the sugar maples start sending their winter stores of food up to the tips of their branches, marking the start of the sugaring season, which will be happening on site. We are requesting a donation of $25 -$50 for the week, which will cover expenses of the gathering and some travel compensation for folks crossing borders. If your bioregion needs some travel assistance, please contact us ASAP. Perhaps fundraising is a special knack you have and you’d like to offer your services? If you are in need of childcare, please send us an email and let us know. Please Leave your K-9 friends at home. Getting there: The closest airport is in Columbus, OH. The GO Bus runs between Columbus/Athens and Cincinnati/Athens. Amtrak services Cincinnati, OH and Charleston, WV. From a TSB statement released at 9:00AM January 3rd — Late last night, blockaders set up two “dump platforms” in trees outside of Diboll, Texas which would otherwise be cleared to make way for TransCanada’s Keystone XL toxic tar sands pipeline. These special “dump platforms” are shielded by an unprecedented 80-100 ft perimeter of life-lines arranged, which if disturbed would certainly dump the two blockaders nested in them roughly 50-60 ft in the air. The Blockaders are sitting in solidarity with the now global “Idle No More” campaign for First Nation’s human rights and tribal sovereignty that very recently started in Canada. This new tree blockade comes just a couple weeks after the end of Tar Sands Blockade’s 85-day tree-sit near Winnsboro, TX. TransCanada rerouted the tar sands pipeline to go around the Winnsboro tree-sit, despite having told countless landowners, including Douglass resident Mike Bishop, that the route was set in stone and could not be altered to avoid bulldozing their cropland, or to go around schools, neighborhoods, or ecologically sensitive areas. This new site is surrounded by barriers like Highway 59, railroad tracks, and Ryan Lake. 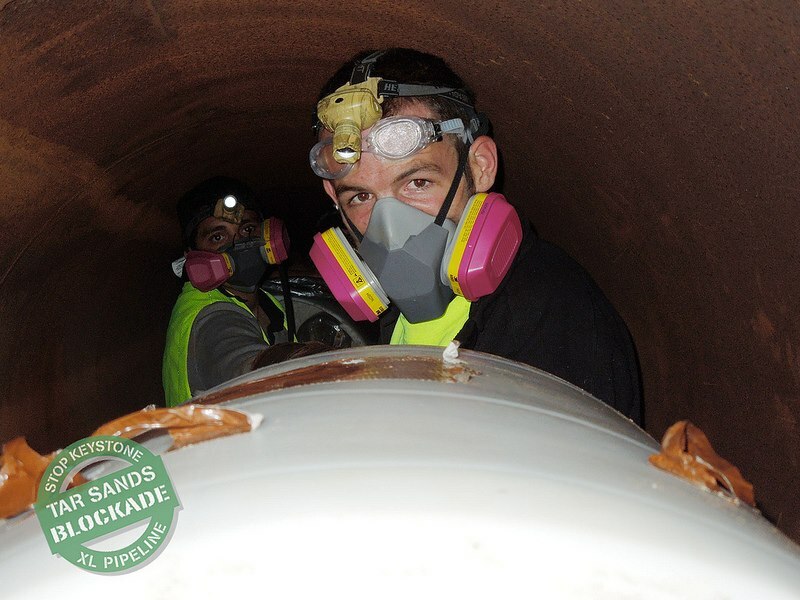 With these nearby, blockaders have found a location around which the pipe cannot easily be rerouted. The viability of this blockade depends entirely on the safe conduct of TransCanada and local police forces. They could easily end it by cutting ropes and seriously injuring or killing the tree sitters. Blockaders Audrey and Mike know the risks. They are prepared to stay on their platforms, just big enough to lie down on, indefinitely, to defend their collective home from the expansion of tar sands exploitation that Keystone XL would usher in. Tar Sands Blockade is a coalition of Texas and Oklahoma landowners and climate justice organizers using peaceful and sustained civil disobedience to stop the construction of TransCanada’s Keystone XL tar sands pipeline. See TarSandsBlockade.org for more info. It’s been a while since we last updated the blog. Sorry for that. We’ve been busy as usual: some of us working on maintaining vehicles, others on putting together our next newsletter, and a few of us participating as trainers, cooks, action coordinators, and general logisticians at direct action campaigns targeting extreme energy projects in West Virginia and Texas. We’re currently in the process of solidifying our winter and spring action plans and we’ll let you know our schedule as soon as we can. For now, we thought we might give a shout out to our friends and colleagues working on the front lines, and link to some important upcoming events. If you are not already involved in these campaigns, think about helping out however you are able (participating directly, sending money or supplies, spreading the word). RAMPS Winter Action Camps in St. Louis, MO (January 7th – 20th): Organized by Radical Action for Mountain Peoples’Survival (RAMPS) and Missourians Organizing for Reform and Empowerment (MORE), Black Mesa Indigenous Support (BMIS) and members of the Black Mesa/Big Mountain Communities. This MORE-RAMPS-BMIS collaboration is yet another part of the growing national uprising against economic and resource extraction. Participants will learn new skills and use them to engage in current campaigns through direct action and community organizing. Texas Tar Sands Blockade (Ongoing): A coalition of climate justice activists are converging from across the continent with local organizers and landowners to put a final stop to the Keystone XL pipeline in Texas. The Unist’ot’en Camp (ongoing): The Unist’ot’en Camp is a resistance community whose purpose is to protect sovereign Wet’suwet’en territory from several proposed pipelines from the Tar Sands Gigaproject and shale gas from Hydraulic Fracturing Projects in the Peace River Region. 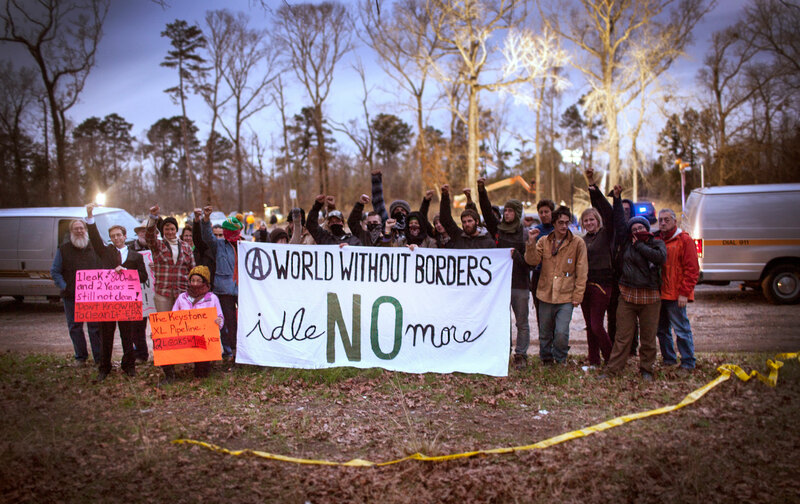 Tar Sands Blockade Mass Action Camp in East Texas (January 3rd-8th): Kick off the new year by demonstrating your resistance to Keystone XL! 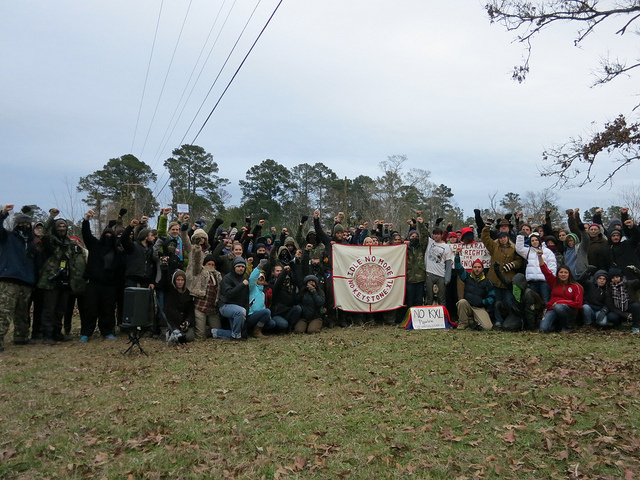 Join the tar sands blockade for another mass action in East Texas on Monday, January 7th, including a 3 day training camp leading up to the big event. Our trainings and events are open and include roles for everyone ready to defend our homes from toxic tar sands. 2013 Earth First! Organizers’ Conference in Southeast Ohio (February 14th-18th): This week-long event will consist of strategy sessions, trainings, action planning, and celebrations with the general prupose of strengthening the Earth First! movement and supporting ongoing campaigns to stop hydro-fracking and the injection of fracking waste in Ohio, Pennsylvania, New York and other impacted areas. For more information on the direct action campaign against injection wells in southeast Ohio, check out Appalachia Resist! 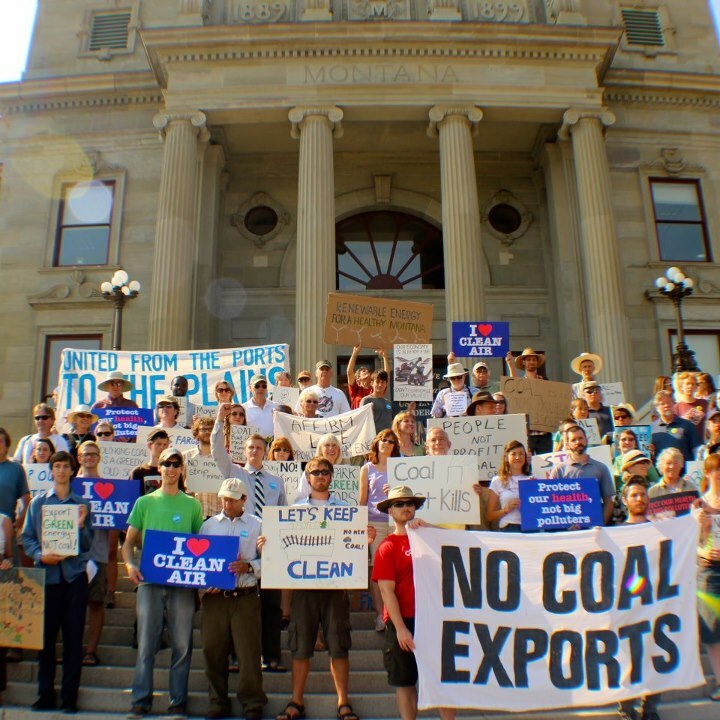 Activists and impacted community members from Montana and surrounding regions demonstrate outside the capitol in Helena as part of a week-long action against coal exports organized by the Blue Skies Campaign. As the summer days get shorter and fall approaches, Seeds of Peace Collective members are taking a well-deserved break from the road. After a busy summer spent criss-crossing the country in support of many exciting events–the mobilization against the NATO Summit in Chicago, the Earth First! Round River Rendezvous in Western PA, facilitating trainings at an Action Camp in Youngstown, OH and another in the Northeast Kingdom of Vermont, the RAMPS Summer Mobilization in West Virginia, and the Coal Export Action in Helena, MT, to name a few–we are finally meeting up and settling down in Montana’s Bitterroot Valley to prepare for the months ahead. In order to help you prepare, too, we’ve already got a roster of events lined up into next year that you can join us in supporting! This fall, although there may not be a need for kitchen support at the annual Black Mesa Fall Caravan, Seeds members will travel to northern Arizona to volunteer our labor in solidarity with the Diné elders resisting forced relocation and coal mining on the Hopi and Navajo reservations. 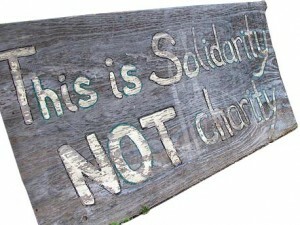 Then, in February, we will travel to southern Ohio to support the Earth First! Organizers Conference, and in the spring, we will head to West Virgina to join RAMPS in their mobilization to end Mountain Top Removal coal mining. Summer will find us in Appalachia once again as we continue our support for Earth First! at the Round River Rendezvous in North Carolina. If this summer was any indication of things to come, we expect our schedule to continue to fill up as more and more people around the country join the resistance. Please contact us if you’d like Seeds to come to an event you’re hosting or if you’d like to join us as a volunteer at one we’re supporting; we’d love to have you! If you can’t join us at an event, you can still help from afar by making a donation–we are a grassroots, volunteer powered collective and rely almost totally on your donations to continue our important work! This September, Seeds members will be in Montana to meet, plan and (finally) finish the conversion of our Dodge flatbed truck to run on Waste Vegetable Oil. We also hope to chip away at another long-term project: the construction of an on-board kitchen in our WVO converted school bus. Both of these vehicle projects are costly, and your help is needed to assist us in completing them. Please consider donating–any amount you can spare will be greatly appreciated, and will make a big difference to us! Finally, we are very happy to report that over the summer, many of our collective members have had the opportunity to begin facilitating trainings. This is an exciting and dynamic component of the logistics and support we are able to provide, so please spread the word! Specifically, we can provide Direct Action, Blockades, and Know Your Rights trainings. To all of you that we met or had the chance to see again this summer, we also want to say a special thank you! Your support at actions, in the kitchen, and on the streets, and your donations of food, money and time, are what have enabled the Seeds of Peace Collective to continue our support of Non-Violent Direct Action for 26 years and running! On Saturday, July 28th, twenty activists were arrested for taking a courageous stand against the surface mining practice known as mountain top removal (MTR). 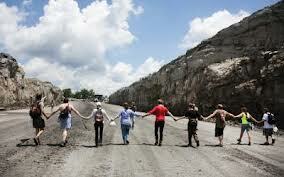 Approximately 50 activists walked on to the Hobet Mine in Central West Virginia, the largest surface mine in the state, and shut down mining operations for the day with a series of technical lock downs, banner drops and tree sits. The action was the culmination of 4 days of workshops and trainings known as the Mountain Mobilization. 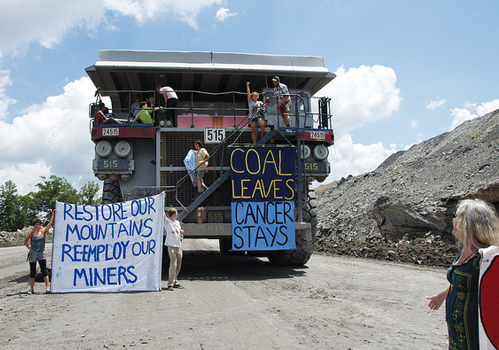 This first-of-its-kind mass action at a West Virginia coal mine was organized by the awesome folks of Radical Action for Mountain Peoples Survival (RAMPS). The action went largely as planned, but the response by the police and pro-coal counter demonstrators, however predictable, were still alarming. WV state troopers responded quickly and with very little negotiation. Threats, physical and verbal abuse and refusal to protect protesters from throngs of livid miners were but some of the ways in which our comrades were treated that day. moving ATVs and trucks. To top it off the police were allowing Friends of Coal trucks through their barricade, presumably to escalate the intimidation of the 30 or so protesters that decided to leave. There was a moment of sweet irony when FOC counter-protesters formed a soft blockade to stop any protesters from leaving. Their attempts at a hard blockade, however, were unsuccessful. The most alarming situation was the arrest of Dustin Steele, a 20 year old West Virginia native who was arrested, taken into a private holding cell and severly beaten by police, then charged with assault on an officer two days later. Seeds of Peace was at the camp from day 1, along with the amazing folks of Everybody’s Kitchen, providing food and logistical support to the camp. By this point we had it down pretty well, being the 4th action camp of the summer and all. We reunited with many friends and built new allies in the fight to end MTR. Additionally, we were able to work on a larger collective goal of branching out from our usual logistical work and provide crucial organizing support. Building on other similar mobilizations this summer, the Mountain Mobilization had a meta-theme of connecting all the active struggles around the country against the increasingly desperate fossil fuel industry. The struggle in Appalachia is absolutely unique and eyeopening, yet provides patent examples of how direct action can be applied to any local struggle. As of Wednesday, August 8, all of the folks arrested last weekend have been released on plea deals, and 1 on bond. There is an amazing amount of momentum that is emerging as a result of these courageous actions and Seeds of Peace is in full support of those that are dedicating their lives to protecting this besieged ecosystem. For more info and updates visit the RAMPS website. Our last substantial blog post was directly after the “Chicago Spring” mobilizations in May, an exciting yet exhausting three weeks of action. In the weeks that followed, we took some much needed R and R and then headed to Western Pennsylvania for the annual Earth First! Round River Rendezvous. This year the RRR took place in the Allegheny National Forest in Northwestern PA from July 1-9. The focus of the RRR this year was stemming the proliferation of natural gas Hydro-Fracturing in the Marcellus shale region, a massive shale formation spanning 5 states in the northeast and mid-Atlantic. The industry is barely a decade old but has exacted an enormous toll on the land and the residents that call this place home. There are thousands of active wells in southwestern PA, most on private land, where mineral rights trump property rights. Hundreds of families have experienced groundwater contamination, serious respiratory and skin conditions and a general reduction in quality of life. Many believe that Pennsylvania is a lost cause, and has become an energy extraction colony to the likes of West Virginia and Wyoming. Nevertheless, there are a multitude of groups working to turn the tide on this disastrous energy boom. We were fortunate enough to immerse ourselves in the issues at this Rendezvous and network with individuals dedicated to bringing direct action campaigns to this part of the country. For recent news on this campaign click here or here. Immediately after the RRR, Seeds of Peace traveled to Youngstown, Ohio for the Ohio Fracktion Camp, a weekend of direct action trainings, workshops and presentations geared towards Oho organizers and residents. We were able to step outside of our normal food support role at this action camp by facilitating trainings and workshops. It was an encouraging weekend that ended in a spirited action aimed at ODNR and their refusal to test “brinewater,” the slurry that is left over from fracking operations. Ohio is unique in the fracking boom, being one of the main states that accepts waste water from extraction sites and injects it into old wells as a form of disposal. This is posing a massive threat to the region and we feel privileged to have played a small part in supporting the growing resistance to this poisonous industry. That is, however, unless the people of Ohio stand up to the state and demand testing and proper remediation. Next, its on to West Virginia for the Mountain Mobilization. State tuned! Round River Rendezvous, Ohio Fraction and more. Updates Soon! We have emerged from a two weeks in the woods supporting the annual Earth First! Round River Rendezvous. We are now headed to Youngstown, Ohio for a Fracking-oriented action camp. More updates on these and other developments, along with some pictures, will be coming soon! Two Weeks After NATO Comes to a Close, We Celebrate Our Successes and Strategize for the Work Ahead. By this point in the “Chicago Spring” most of us on Team Kitchen seemed to be experiencing two simultaneous feelings. One of those feelings was sheer exhaustion – to a degree that elicited a sensation of operating on auto-pilot. The other feeling was one of efficiency, practice and execution. The lifting, planning, prepping, cleaning, delivery and serving became easier every day as we settled into our new space and got to know the city. Being on top of our game could not, however, make up for the holes in the logistical framework that were apparent once the weekend started. A hastily organized communications group, a less-than-ideally located convergence center and the difficulty of getting around a sprawling metropolis added layers of difficulty to what could have been an otherwise well attended and well fed mass mobilization. The first day of the NATO summit, Sunday the 21st, started with a rally at Grant Park and ended with a march to McCormick Place. The event was organized by Iraq Veterans Against the War and the CANG8 coalition, two groups that we had been working with throughout the month. Going into the event we were under the impression that we would be serving food for 5000 people. So, for most of the day before and the morning of, we made all the beans, rice and salsa that we could transport. In the end we served between 1500 and 2000, far shy of the number we had planned. That all went with few hitches. That is, until we arrived and discovered that CANG8 had not made any effort to provide water for the roughly 5000 people on the march. So, Seeds of Peace in conjunction with Chicago Action Medical spent 3 hours in traffic picking up and delivering a pallet and a half of bottled water to the marchers while they were en route. It saved the day, to say the least. Not to complain too much though: the organizers in Chicago did some amazing work given the circumstances. The real wild card were the 1000+ occupiers that were bussed in from all corners of the country, many arriving with no gear or food. Having little experience in mobilizations of this caliber, and lacking a directed message for the heads of NATO, the energy that weekend was overshadowed by out-of-towners and felt scattered, misdirected and generally misused. After the umpteenth march against the police it was apparent by Sunday evening that the effort to SHUT DOWN NATO had been certifiably unsuccessful. Bolstered by months of pre-washing by local media on the dangers of these protests, strong-arming by the city and a massive police mobilization, the message “END THE WAR AND POVERTY AGENDA” fell largely on deaf ears. For those who attended, however, and those who payed attention from across the country and around the world, it was inspiring and successful in many other ways. There were numerous people that gained critical skills in networking, medical aid, food support and media. The medical infrastructure, organized by Chicago Action Medical, was well staffed and offered an array of free health services throughout the week. The Indymedia center, located just a few blocks from the kitchen, had cameras and eyes on the ground at all times and provided live-streaming and coverage of the events. As always, our pals with the National Lawyers Guild were everywhere, keeping an eye on police actions and helping the 75 or so folks that were arrested. In the kitchen we worked around the clock to feed the seemingly endless actions and marches over the course of a two week period. When the last dinner bell rang we tallied about 10,000 free meals, from May Day, Spreading the Health Medic Conference, Peoples Summit, #Ochi foreclosure march, Rising Tide tar sands march, National Nurses United rally, Health Care march and rally, IVAW march, the Health and Wellness medic center, convergence center and finally the actions at the Boeing headquarters on Monday, May 21st. We were able to facilitate waves of eager volunteers to assist in feeding the masses, which, at times, seemed to be a double edged sword. During similar mobilizations in the past, Seeds of Peace would generally provide ONE large lunch or dinner for the day’s event. This time around we stretched ourselves a bit thin. 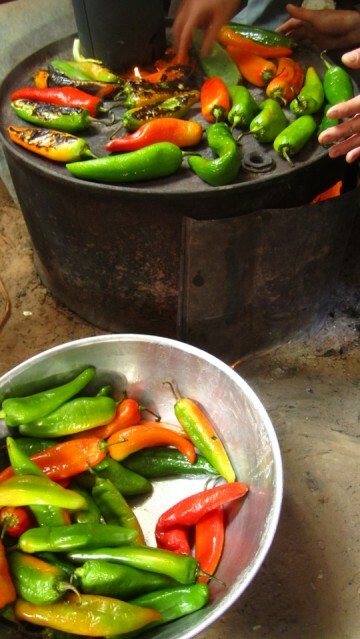 There was often a wave of help in the morning, allowing us to prepare the day’s big meal with ease. The hard part was returning to find few to no volunteers, a mountain of dishes and a meal to prepare and deliver in three hours time. With every mass action there are things that stand out, and that was certainly true in Chicago. One of the more salient aspects of our Chicago experience was the lack of police harassment (towards the kitchen, anyway). There was the usual monitoring, both seen and unseen, and one brief, intimidating attempt by the police to enter a house where many Seeds members were staying. We made it through unscathed, which is unfortunately not the case for three individuals who were targeted through police infiltration before the summit began, and who are now facing trumped up terrorism charges as serious as they are bogus. Another stand-out part of our experience was the difficulty in finding produce donations. The produce docks were less than fruitful, as it were, and we had to spend more money on produce, and food in general, than we would have otherwise. In the past, Seeds of Peace has been more directly involved in setting up the necessary components of mass mobilizations. For our time in Chicago, however, putting together and maintaining a kitchen for food support was about the limit of our abilities. With some notable exceptions, the mobilizations in general were mediocre at best, counter-productive at worse. Was it worth the effort on our part? Well, if we thought it wasn’t then the “Chicago Spring” would have gone hungry. Providing this critical infrastructure, even if it is not fully recognized or appreciated, demonstrates for everyone involved that we can create support systems and have a direct impact on those who gather for justice, in all it’s forms. An incomplete list of people and groups who helped make this possible: Layla, Jeffrie, Scott Mechanic, John P., Kelvin, Eric R., Mandy and Occupy Chicago, Ron and the Locked Out Collective, First Trinity Lutheran Church, Nancy the composter, Katie, Subway and Humboldt Park FNB, Peter, Gabe and Rogers Park FNB, Margo M., Katie T., Vermin Supreme!, Keith McHenry, Lisa F., Door to Door Organics, the Plant, Peoples Action Center, Equal Exchange, Once Again Nut Butters, Chicago Action Medical, Movement Resource Group and the fabulous folks at the Grand Manor. Thanks to everyone who made our time in Chicago a memorable one, even if I forgot to mention you! Shoot us an email at seedsofpeace[a]riseup.net if you would like to receive periodic email alerts concerning upcoming events and volunteer opportunities as well as a digital copy of our annual newsletter.